This is the first year I am opening these special retreats to the public. 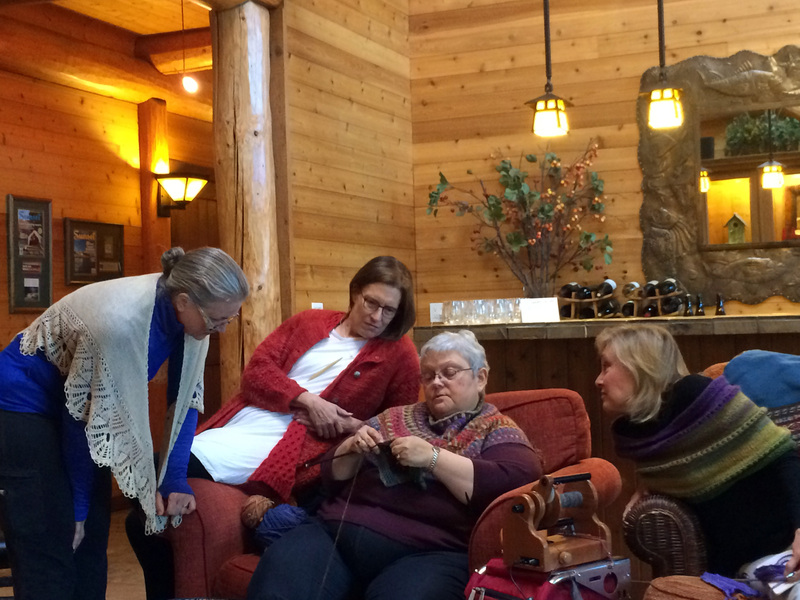 Each February for the past four years, a group of beloved knitters and I have been developing what we think of as our “silent knitting retreat.” We undulate between periods of silent knitting and periods that give rise to peaceful talking and knitting demonstrations. This devotion carries us all week like floating blossoms on a balmy stream, growing deeper and more profound day by day. This same tender abundance streams through all of my teaching events. These retreats are dedicated to welcoming this sweet mystery and is designed for those who want a quieter, deeper time together. Participants often discover a newly awakened trust in their ability to design, and everyone feels a deep sense of relaxation, rejuvenation, insight, love, and wholeness to take back into the world along with new life-long friendships. I do not plan specific projects ahead of time; rather I respond to individual wishes on a moment-by-moment basis. I first received permission and an invitation to teach in this graceful manner many years ago during my elementary school teaching internship, when a supervisor asked me what might happen if I went into the classroom without preparation and simply followed whatever evolved. I’d been struggling to plan lessons and meet curricular expectations without compromising my instinctive ability to connect with students and authentically accompany them in our learning. “You’re giving me permission to do that?” I asked, and he nodded, like the wise man one meets in a fairy tale. I taught school for a decade and then moved on to teaching curious knitters around the world while this clarity and mystery reverberated within me like a steady center. It is why I love to teach. When I meet you as you are, and accompany your best self in your present evolution, it is close to effortless, like a glass of clear water. Come join us in this sweet space—it would be a joy to have you with us. I do ask that you describe for me why you are drawn to this retreat when you write to ask if there is space—thank you.